Tokyo is a digital metropolis and wellspring of spectacular pop culture, its commercial crossroads carpeted with people day and night. Above them, watching from perches on buildings and power lines, are more than 20,000 crows. As their numbers soared in recent years, Tokyo fought back: trapping them, destroying nests, and securing trash. The crows adapted; they are among the smartest of animals. The 13 million people of Tokyo now live alongside them in a stalemate. Tokyo Waka tells this story, and a larger one as well. A Buddhist priest comments on garbage as the remnants of desire; a gardener considers the relentless persistence of nature amidst urban grit; a homeless woman talks about forging community in her tent village deep in the corner of a city park. 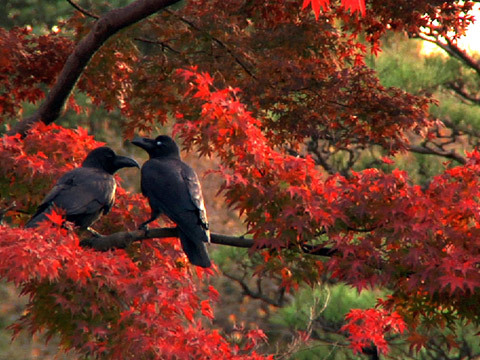 Tokyo Waka gives these smart, opportunistic crows their due, but the film is ultimately an episodic and discursive poem about the life and culture of Tokyo, one of the great cities of the world. Kristine Samuelson has been a documentary filmmaker for over twenty-five years. Collaborating with her partner, John Haptas, she has made many documentary essays, including: Riding the Tiger; The World As We Know It; Empire of the Moon; Wrong Place, Wrong Time; The Days And The Hours; and I Can See Everything. All have screened in festivals worldwide, including the Sundance Film Festival, San Francisco International Film Festival, Vila do Conde Curtas Metragens, Mannheim Film Festival, Mostra Internacional de Cine, Margaret Mead Film Festival, Stuttgart Filmwinter, and Ann Arbor Film Festival. Prior to their collaborative work, Samuelson made other films, including Arthur and Lillie (co-producer and director), which was nominated for an Academy Award. She is a professor at Stanford University, where she has served as chair of the Art & Art History Department and director of the Film and Media Studies Program. Professor Samuelson was a 2010 US-Japan Creative Arts Fellow. John Haptas is a documentary film editor. Among his editing credits include Soundtrack to a Riot for Frontline World (Emmy Nomination), Hunting the Hidden Dimension, a program on fractal geometry for PBS Nova ("Pierre-Gilles de Gennes" Science Film Prize), and Inside Guantanamo Bay, a two-hour National Geographic Explorer special (editor/co-writer; Emmy Award nominations for Best Documentary and Writing). He is currently editing a film about Susan Sontag.